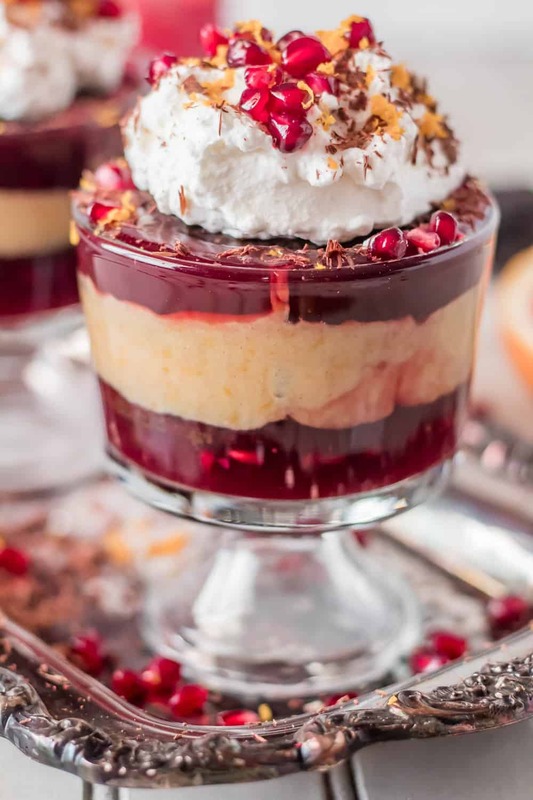 A hint of cinnamon and chipotle in a brownie provide the base for this indulgent Mexican Chocolate Trifle with Orange Curd and Pomegranate Pudding. 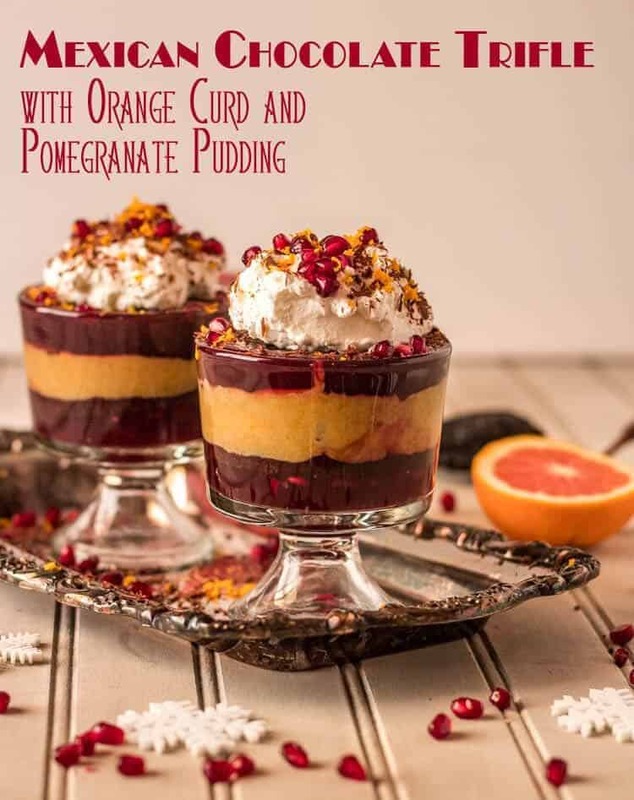 The fresh orange curd gets a hint of cinnamon, and the pomegranate pudding with its pomegranate juice, pomegranate molasses, and pomegranate arils gets thickened with tapioca. The result is a festive, holiday trifle with vibrant and fresh Mexican flavor! Fantástico! 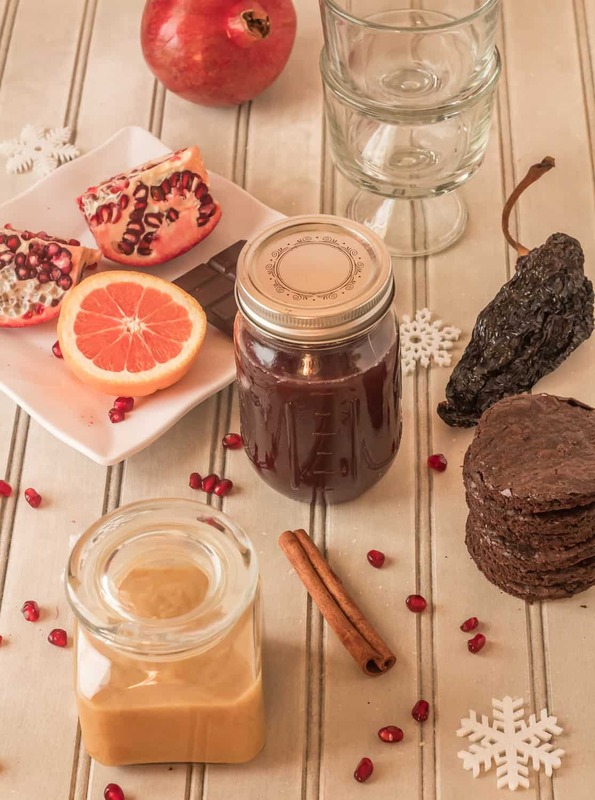 An observant reader may have noticed my recent and somewhat repetitive emphasis on Mexican flavors that include chiles, pomegranates, citrus, and cinnamon… First, I love that flavor combination. Second, pomegranates and citrus are in season in the Rio Grande Valley, and its amazing! Besides, what’s not to love? 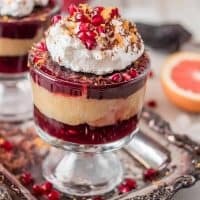 My Mexican Chocolate Trifle with Orange Curd and Pomegranate Pudding is the final installment in my Cozy Christmas Menu for Two 2017 series of posts. I hope you didn’t miss the Roasted Spicy Orange-Pomegranate Glazed Winter Vegetables, and my Festive Mexican Cornish Game Hens for Two! This menu bears no resemblance to Mexican-American fare; rather, it combines Mexican ingredients and flavors with fresh seasonal ingredients to bring those vibrant flavors to your holiday table. So, live a little, and give this Mexican Holiday Trifle a try! 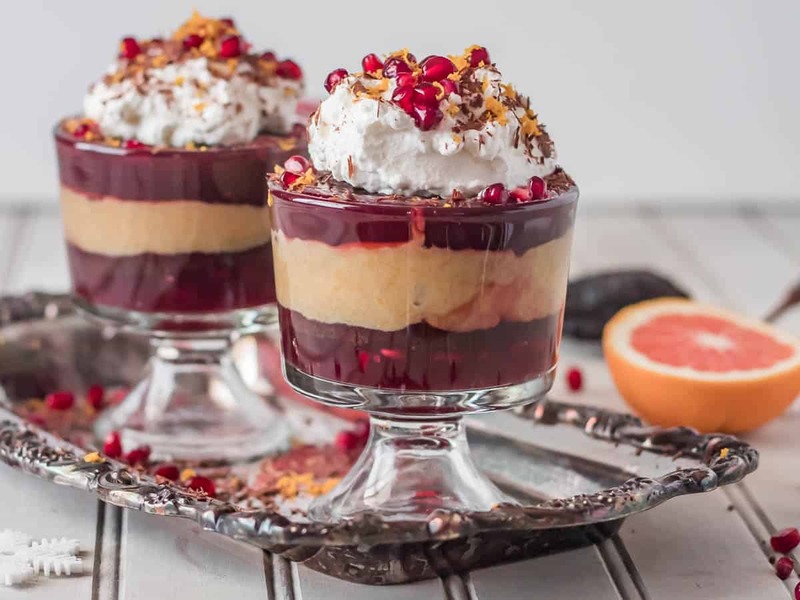 A hint of cinnamon and chipotle in a brownie provide the base for this indulgent Mexican Chocolate Trifle with Orange Curd, and Pomegranate Pudding. The fresh orange curd gets a hint of cinnamon, and the pomegranate pudding with its pomegranate juice, pomegranate molasses, and pomegranate arils gets thickened with tapioca. The result is a festive, holiday trifle with vibrant and fresh Mexican flavor! Fantástico! Prepare brownie mix according to package instructions. If there is a "fudgy" as opposed to "caky", choose the "fudgy" option. Thoroughly mix in the cinnamon and chipotle powder. Spread the brownie mixture in a pan larger than recommended. I use a half sheet pan to achieve a thickness of about 3/4 of an inch. Cook until set in the center (10-15 minutes with my mix and oven combination). Allow to cool completely. I served the trifle in small glass trifle dishes, and used my large biscuit cutter. Cut the cooled brownies in a shape that will fit in your dishes. Add the orange zest and sugar to a food processor. Process until the zest resembles fine crumbs. Add the remaining ingredients, and process until very smooth. Pour the mixture into a small saucepan and cook over low heat until thickened, (about 10 minutes), stirring constantly. The curd is ready when it coats a spoon, and registers about 175 degrees F on a candy thermometer. Be careful not to overcook, or it will curdle. Remove from the heat and let cool or refrigerate. Add the tapioca to the pomegranate juice in a small saucepan, and allow the tapioca to soak (no heat) at least 30 minutes. Start with a layer of the pomegranate pudding. Top with an appropriate sized piece of brownie. Add a layer of orange curd, and another piece of brownie. My trifle dishes allowed for a second layer of pomegranate pudding, and a final piece of brownie (for a total of 3 brownie layers). I then top the trifle with REAL whipped cream and garnish with grated orange zest, pomegranate arils, shaved chocolate. Cinnamon is another nice option! I use Duncan Hines Dark Chocolate Fudge Brownies for a 13 x 9 pan, and cook it in a half sheet pan for 10-15 minutes. Watch carefully, and remove when set but still soft. I have a razor sharp Microplane 38006 Professional Series Large Shaver that did a great job with minimal effort. You want pieces rather than fine zest. After removing zest, squeeze the juice. You'll need 1/4 cup. I use Bob's Red Mill Small Pearl Tapioca. If you substitute quick cook tapioca, adjust cooking time, and I cannot attest to the results being the same as I've not tried it! I whip my cream and add a tablespoon or two of powdered sugar. You can use commercial whipped cream, but PLEASE don't use fake stuff! Hi Tamara, I am making this dessert for our gourmet group. How far in advance can I fill the trifle cups? Do you think the brownies will get too soggy if I fill the cups the night before I serve them? Thank you! Hi Karin! I've always had good results making trifles several hours in advance. I'm not sure that I've done them the night before, usually the morning of. I prefer the brownie/cake layer to absorb the puddings, so I would think it would work fine... Let me know how you like it! Such a great idea to put together the Christmas for two series. The Mr and I often spend Christmas with just the two of us and we certainly do not need gobs and gobs of food. That said, this year we decided at last minute to go to a ski resort. But to be honest. . .the food has been blah and I'd much rather have what's on your menu. Love a little Mexican spice action paired with chocolate. So good. Happy holidays to you. Resort food rarely measures up for foodies ;-) I hope the skiing was fantastic Lynn! Happy New Year!